A box of tea chocolates arrived in the post last week. This was The Winter Selection from Matcha Chocolat, the final one in a seasonal series. I’ve already eaten my way through: The Lotus Selection, The Jade Selection, The Emperor’s Selection. Having very much enjoyed them, I was looking forward to the latest one with some anticipation. The familiar square pink box with the teapot logo got me salivating as soon as I saw it. I opened the lid and the familiar waft of deliciously aromatic chocolate with a hint of tea was immediately liberated – oh good. Jasmine Pearls – This white chocolate dome had a beautiful green swirl across it that almost looked like Chinese calligraphy. The aroma of chocolate and jasmine tea was noticeable even before taking that first anticipated bite. The exotic floral flavour of jasmine tea was immediately released and combined well with a particularly delicious white chocolate that was not nearly as sweet as white chocolate can sometimes be. The mixture of bitter tea, jasmine perfume and sweet chocolate was well balanced and created a harmonious whole. It had a creamy texture in the mouth as it melted and I knew I could easily eat more of these than would be good for me. Mint & Green Tea – This crisp milk chocolate dome with pieces of gold leaf on top had a sweet spicy smell with a hint of mint. The milk chocolate seemed just right and the soft and unctuous ganache melted in the mouth very quickly. As it melted, the mint flavour was quickly released with the green tea following soon after. Mint chocolates are very hard to do well as the mint can be overpowering and have a harsh, artificial flavour. This mint had presence with the authentic notes of real mint; these lingered long after the tea had faded. A truly delicious chocolate. Matcha – A square milk chocolate shell with a gorgeous coppery top and spiral patterning. This had a strong, robust yet sweet smell of cocoa, but with the matcha infiltrating the scent. When bitten into there was no mistaking the distinctive umami presence of matcha, This was CT’s personal favourite, for me it was a little too powerful. It worked well with the sweet milk chocolate, which ameliorated its more extreme tendencies. CT thought this had a kind of punchiness, less rarified and more forceful than the others – just right for a samurai to fortify himself before battle (or setting off on the daily commute). Earl Grey – Decorated with a piece of candied orange sat jauntily on the top, this dark chocolate dome was strong and sharp. It produced an immediate and powerful chocolate hit. The taste of Earl Grey was more subtle than the others, as one would expect from this delicately flavoured tea. The taste came through a while after the first spike of chocolate had been registered – all the more reason to move the melting mass around in the mouth; this chocolate does not give up its secrets quickly. The ganache was beautifully smooth, as I’ve come to expect from Katie’s chocolates. This gave them the usual silky mouth feel which was an interesting contrast to the drying effects of the tea. Masala Chai Caramels – These were particularly pretty. They had a contemporary feel being heart shaped with a pink impressionistic brush stroke on the top. They smelt sweetly of cardamom. The first taste to register, unsurprisingly, was that of cardamom. This was followed by the sweetness of the caramel, then the black tea unexpectedly stormed the palate, followed finally by the smoothness of the milk chocolate. The consensus was, yum scrum, more for our tum (s) – please! 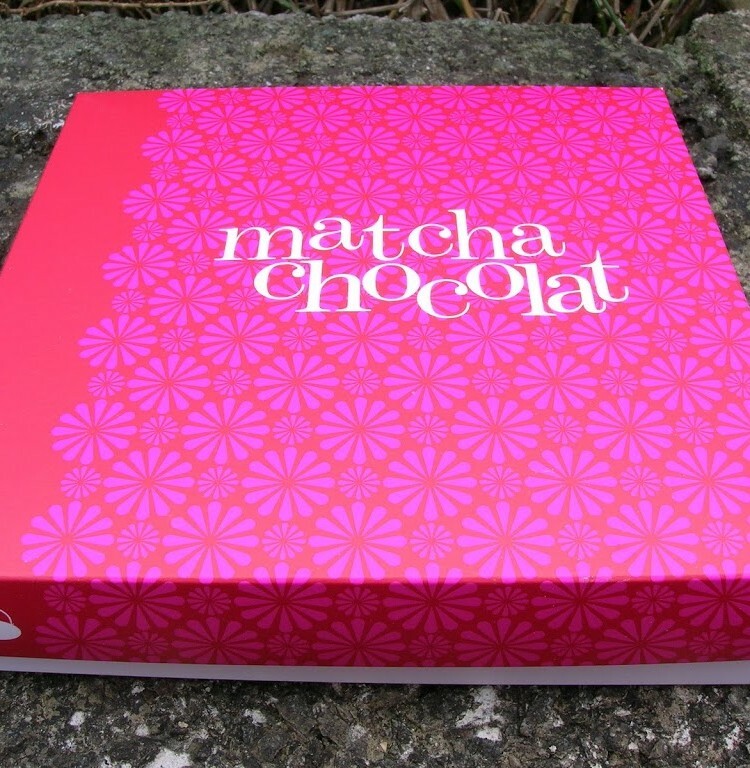 I was not disappointed, this box was another winner from Matcha Chocolat and it might possibly be the best. I’ll just have to try the whole range all over again to find out. With the Christmas season fast approaching, this would make an ideal gift. In fact, I’ve just ordered one for this very purpose. With the chocolates, Katie kindly included a sample of Jasmine Pearls leaf tea from Canton Tea Co. We sipped this in between sampling the chocolates. It was lovely to see the pearls unravelling into spidery shapes when the hot water was poured over them. It had a powerful heady jasmine aroma when poured and an equally powerful, but very pleasant taste, rather more of tea than flowers. A little goes a long way. As all good teas should be, this was very refreshing and CT thought it was the perfect antidote to the stresses and strains of chocolate tasting. YOu are a lucky lady – so much free chocolate! Ha ha, poor old CT, he has a terrible lot in life. Those Jasmine Pearls look gorgeous. How perfect looking they are. As always, Choc, your tasting notes are edible – I can almost taste the flavours as I read them! Thank you for all of your comments. I can only reiterate that these are decidedly special chocolates. MMMMMM,..all of these chocolates look just stunning & lovely too! Oxslip – not sure where these are on sale other than online, but they are worth looking out for. Sophie – thanks. Praise indeed, coming from the chocolate capital of the world. I’ve been trying to exercise and drink more tea everyday. With geo cities and these flowering teas, it’s been a breeze! Up til now, Jasmine Flower is my favorite! So nicely described by you. I really want to hunt down a box of these.